There are not too many books describing the exploits of two lesbian grannies. 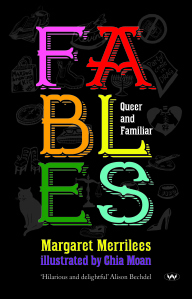 Adelaide author Margaret Merrilees gives us 52 ‘fables’, one for each week of the year; snapshots of life in this lesbian granny household and their extended family and friends. You might think Merrilees will only find a niche market for this book. You’d be wrong. This book should be widely read and deserves to be because it is enjoyable, moving, witty and downright funny. The back cover blurb describes the stories as ‘wry, affectionate’, and they are. But there are also many laugh-out-loud moments in the book. Each reader will take something different from the tales, and may identify particularly with one or more of the characters. I found the escapades of the grandson, James, particularly funny. Most of my outbursts of laughter were in response to his thought processes and his observations of the adults around him. Merrilees has a lovely writing style. The fables are beautiful observations of the the lives of the grannies. To say it is an ‘easy read’ would be to devalue it. It is certainly an enjoyable read – I looked forward to each new instalment. It is also a fascinating reflection on the lives of two activists, reaching their later years, looking back on their younger selves and dealing with the challenges of children, grand children, aging parents and their own long-term relationship. Read it. You will laugh out loud too. This is an impressive first novel. The characters are well drawn. There is a mood of impending doom from early on, and Kernot builds tension right through the book. It is a gripping read, but also takes time to incorporate significant social commentary, without being ‘preachy’. The lives of the inhabitants of one street are intertwined, each facing different challenges: bullying, domestic violence, gambling, mental illness, adjustment to retirement. The characters are engaging and the reader is drawn into their world from page one. Whilst it is set in contemporary Australia and has specific Australian references (Centrelink, Commodores, ‘pokies’ etc. ), it might almost be any western country where people face similar challenges. Tuesday 14th June 2005 I don’t trust this town, perhaps because I am exhausted, and exhaustion makes me feel vulnerable. The people seem sly, unlike most Cubans I have met so far. They take less care of their dress than other Cubans. They know their town is a passing-through-place between Havana and Vinales. They mentally weigh the wallets of in-transit tourists, grieve the convertible pesos passing by on each bus, car, taxi and even bicycle. My bicycle leans against a wall under a verandah. I sit, propped against my bicycle, my stomach cramped, my legs weak. My exhaustion brought on by a 45 kms unintended detour on a rough and windy road. I am back in La Palma which I thought I had left behind me 3 hours ago. I flag down a taxi, a huge, ancient American limo. He says it will cost CUC$20 to Vinales. I don’t like him and I don’t like the fare. Despite my exhaustion, I say “no thanks”. Out of the resentful crowd a well dressed man appears: tweed jacket, tie, clean cut, mid-thirties. He could be a Spanish teacher in an Adelaide high school. He sees my distress, offers to help me find a lift to Vinales, negotiates with a taxi driver to pick me up when he has finished his current fare. It will cost 10 CUC$. We sit and talk for an hour. I notice that he scans the passers by every few minutes as if expecting an unwelcome visitor. He is a lecturer in Art at the university. This unattractive town has a university campus, part of the University of Pinar del Rio. His name is Tony. His English is excellent. He says Cuba is ‘morbid’. An Australian might say the place is ‘dead’ but he doesn’t mean it in the same way I don’t think. In his terms, I think he means that it is in the grip of a stultifying force. He tells me about Fouché . I have to ask him to explain. Fouché was Napoleon’s Minister of Police. It was Fouchés job to watch Napoleon’s opponents and rivals. But, Tony says, Napoleon did not trust Fouché , so he had people spy on Fouché , whilst Fouché in turn was spying on everyone else. Cuba is the same, Tony says. We are probably being watched right now, and someone will be reporting to the authorities that on 14th June 2005, Tony Sarmiento spent an hour talking to a touring cyclist in La Palma and that they exchanged pieces of paper. The taxi arrives. Tony and the driver help squeeze my bicycle and panniers into the back of the small car, which already carries two other passengers, one from Norway, one from Germany, and their luggage. We swap email addresses, shake hands. He walks off, looking over his shoulder. Queuing along a shadowy passageway leading down to the local ferry from Havana to Casablanca and Cojimar. My bike worth ten years wages to the Cubans pressed in around me. It’s claustrophobic. It’s humid. My paranoia is mounting. The queue shuffles forward. Even the locals are sweating. One hand on my wallet. My thoughts of a stiletto knife and the ease with which one could be slipped between my ribs. 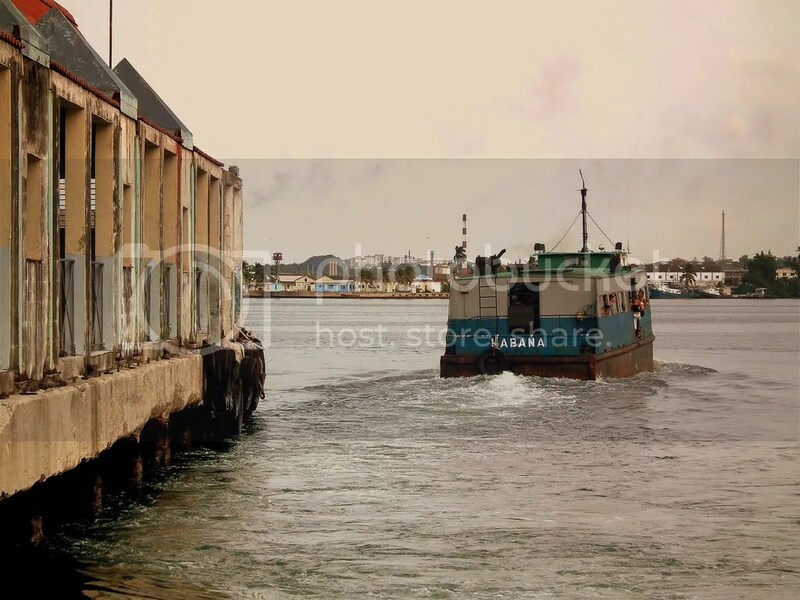 My eyes drawn to the dark gap between ferry and quay, tailor made for a tourist’s body. My attention sought by a ragged man and his ragged wife in front of me. They are staring at my wallet and the Convertible Pesos * folded inside it. He gesticulates to me and then to his wife. She looks too old, surely, to be a prostitute, though she is probably younger than me. I don’t understand his gap toothed Spanish. Can vaguely interprete “too much, too much”. Too much what? I have too much money for one person in a socialist country? I have too many possessions and those around me have too few? I tighten my grip on my bike, push my wallet deeper into my pocket, keep edging forward towards the rough looking, swarthy Cuban collecting fares on the gangplank. The old man is getting more and more agitated, keeps pointing to his wife and to me. At last she reaches into her purse, pulls out 40 centavos, local currency, the ferry fare; gives it to me, to save me using a whole convertible peso, for which I would receive no change.